This is a temple devoted to Lord Ayyappa in Marthandam. 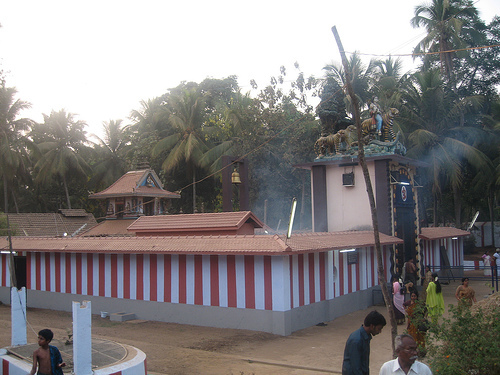 Vedivechan Kovil – Vettuvenni Sastha Temple is located 2 km from Kuzhithurai Bus Stop. It is just by the side of the national highway that connects Trivandrum with Nagercoil. This temple attracts many pilgrims from all over the world. It is commonly known as either Vettuvenni temple or Vedi Sathan Kovil. The name Vedi Sathan Kovil is due to the firecrackers that are burnt in the temple as a mark of prayer for Lord Ayyappa. Vettuvenni Sastha temple was originally known as Irumpudayaan Kandan Sasthan kovil. The temple complex was built in 1981 by the first Amman. The history of the temple is based on the period of the Ramayana. The primary god of the temple is Sree Dharma Sastha. Other sub deities are Prabha and Sathyaka. It is believed that Sri Rama came along with his wife, brother and his whole tribe of monkeys after defeating Ravana in a battle. He then visited Sasthamcotta to perform a ritual of honour to Sri Dharma Sastha. Sri Rama offered rites to ancestors. Devotees believe that Neelan is the predecessor of the existing tribe of monkeys found around the temple. Another legend has it that, a prince from Pandalam and a princess from a royal family united in wedlock and camped here. The prince used to pray at the Sabarimala shrine. With time he found it hard to visit the shrine routinely. This made Lord Ayyappa angry at the prince, and the prince had to ask for forgiveness for the mistake. So the prince went to Sabarimala and worshipped there for twelve days. On the last night of the twelve days worship, the Lord appeared. The prince was asked him to go to Sasthamcotta and worship Sri Dharma Sastha. Lord Ayyappa knew that the holy presence of Sabarimala also occurred there. This meant the prince would no longer need to go to Sabarimala for worship. The king of Kayamkulam then refurbished and redecorated the temple. The interesting attribute of this temple is the number of monkeys that hang around. Locals believe that the temple monkeys are the divine advisers of Sree Dharma Sastha. The temple is popularly known as the tribe of monkeys that reside there. This is one temple that has a large population of monkeys. The temple remains open only for 127 days a year. The important festivals of Vettuvenni kandan sasthan Temple fall in May, (Pankiniutthiram) are celebrated for 3 days with gaiety. The dawn of the Vrichikam month occupies a special place in the pilgrimage calendar. On this day pilgrims walk to reach the shrine of Lord Ayyappa reverberating chants ‘Swamiye Saranam Ayyappa’, meaning ‘Lord Ayyappa – the only refuge’. The Malayalam month of Vrichikam (November) ushers another period to visit the hill shrine dedicated to Lord Ayyappan or Dharma Sastha. Devotees agree that a pilgrimage to Sabarimala is a symbiotic combination of mind power, determination, physical stamina, and faith to reach the sanctum sanctorum! The temple is open every day including Saturdays and Sundays. The temple is opened from 0500 to 2000 hrs. The temple is also open during public holidays.